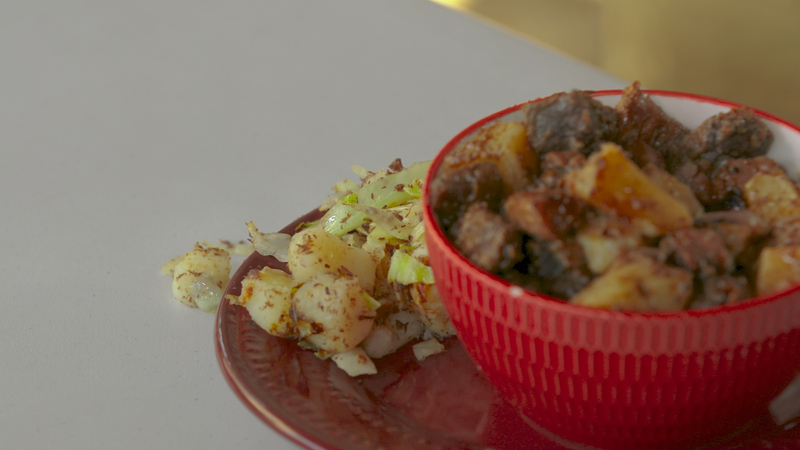 This recipe comes with a traditional side dish called “Bubble & Squeak”, which just sounds way too fun not to make. Add seal in there for more good times for your belly all around. • Cut up seal meat into stew sized chunks and dredge generously in a bowl of flour until all chunks are coated then add to heated skillet and fry in the oil or animal fat. • Give the meat a stir then add the onions and continue frying and stirring until mixture is evenly browned, scraping bottom of pan to prevent flour from sticking. Add more oil. If the flour absorbs oil, start adding butter for extra flavor. • When mixture is fully browned, add stock and cover with lid. Turn heat down and allow stew to simmer until meat is tender and gravy has thickened, about 40 minutes. • Cut cabbage into thin strands and fry in fat in a pre-heated med-high skillet. • When cabbage begins to brown, add cubed boiled potatoes and season with salt and pepper. • Continue to fry stirring occasionally until the mixture browned and caramelized. Remove from heat and sprinkle in powdered moose. • Serve hot seal and gravy with the piping hot Cree style Bubble & Squeak.